Over the past two lessons, we've learned what intervals are and how intervals appear on the guitar fretboard. We now need to firmly cement and internalise this knowledge so that moving between intervals becomes almost second nature. 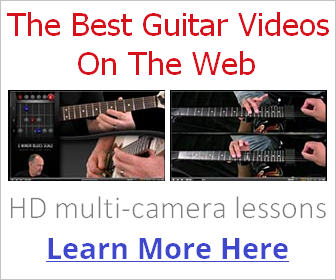 This will have a profound effect on your ability to move fluidly over the guitar neck and instantly connect elements such as chords, arpeggios and scales. By spending time on this stuff, you'll already know more than 90% (probably higher) of guitarists out there. Following the guitar interval practice techniques in this lesson will prepare you in the best possible way for learning other elements of guitar theory. In previous lessons, we've been moving between two notes - a starting note followed by an interval degree. Once you're confident with moving between two notes like this, the next logical step is to create sequences of two or three intervals and move between them. What this does is train your eyes and ears to see and hear intervals in relation to other neighbouring intervals related to the same root/starting note. For these examples, I'm going to use the starting note of A. But remember, just as with the charts in the previous lessons, these interval units/clusters are movable in their fixed formation and relative to your chosen starting (1) note. What I find useful is to complete each cluster both by ending on the 2nd interval and ending on the octave of the starting note. This helps train your ear to hear unresolved and resolved sequences (the resolved being that which ends on the root). Alternatively, download the PDF here if you want to print out these exercises as separate diagrams. Not every combination is covered there, but you get the idea. Take two intervals in relation to starting note and try moving between them, observing how each interval relates to the position of the other across the strings. An awkward inconsistency is the relationship between the G and B strings, as they are tuned differently to the E-A, A-D, D-G and B-e strings. So while you may see reoccurring patterns on the latter strings, the G and B relationships can be seen as one fret difference. Don't just play from the 1 note either, try moving from the highest interval ending on the root. You could call this a descending interval sequence. Try different root notes. The above examples started on A. Even though the interval relationships are exactly the same no matter where you start, being able to see them in different positions of the fretboard will avoid any confusion in sharp or flat keys. Try adding another interval to the sequence. For example 1 - b3 - #4 - 5. The more you play around with different combinations, the more you will be able to pick up these relationships in music by ear. This leads to anything from knowing which notes to use in a solo to being able to play chord progressions in different keys. Note: This knowledge is not as important, but useful to at least be aware of! Relationship b2 - 3 b2 - 4 2 - 4 2 - #4 b3 - b5 b3 - 5 3 - 5 3 - #5 etc. So if we saw the relationship 1 - b3 - b5 we'd know it's a sequence of two minor 3rds. Similarly, 1 - 3 - #5 is a sequence of two major 3rds. Incidentally, those four relationships make up the four types of triad, which we'll explore in later lessons. So return to the diagram from earlier and you have yet another way to test your knowledge of these interval sequences. That's it for the series! If you've followed the lessons closely and spent time practicing what you've learned, you will have laid the solid foundations for becoming a confident, unrestricted and intuitive guitarist. These three qualities stem from a good knowledge of intervals. It should be a pretty smooth ride from now on!